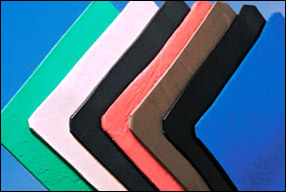 Compounds made from Nitrile rubber and PVC have excellent physical and chemical properties, that is why it has got maximum share in Printing applications properties of Nitrile get enhanced with straight PVC, there by excellent properties can be availed for different applications over nitrile only. Can be Extruded and Calendared with ease. Excellent grinding finish with compression set property special series are also available for different applications or we can supply as per required specifications. One of the best in class of polymers as far as oil resistance is required at economical price. Low compression set properties so one can get better sealing properties, Nip properties, better abrasion properties & can be formulated for longer life or as required. Ozone resistance can be increased with different combinations to suit customers demand. Resistance to oxygen and ozone. Compounds made from EPDM rubber have excellent resistance to ozone chemicals (like acid, caustics, steam water etc) due to its versatile structure and saturated backbone. Can be easily Extruded, Calendared thereby easy to fabricate even in harder compounds. Application: - Printing, Industrial rollers and Automotives. Temp Resistance: 50°C to 100°C. One of the highly consumed polymers in the world. Mainly it is isoprene. Best properties can be fabricated as far as abrasion, resilience fatigue, Modulus, Tensile strength impact resistance and tear strength are required. Flexing properties can be enhanced with suitable fabrication. Industries like Paper, Textile, Steel, Cement and many more require products made out of it. Aromatic oil resistance is less can be easily extruded, calendared and fabricated due to very good tack. Mainly used where continuous high temperature is service is required. Industries where low co-efficient of friction along with release properties are required. Can be formulated as per required specifications. Can be easily extruded and calendared so easier for making products on Strip Building Machine. Because of its inherent oxygen and ozone resistance and crystallization, it offers best mechanical and fair oil resistance. Due to mechanical, oil resistance, dent resistance, abrasion resistance ease of extrusion and calendaring makes it versatile for various end uses.